At the weekly sheep sale on Saturday 14th October there was an increased entry of lambs selling to £80.00 and fat ewes to £73.00. Lighter weight lambs sold to £3.52ppk. FAT LAMBS: Annalong farmer 28kg, £80.00, Rossglass farmer 24kg, £79.00, Downpatrick farmer 27kg, £78.00, Ballynahinch farmer 26kg, £77.50, Raholp farmer 25kg, £77.50, Killough farmer 25kg, £76.00, Dromara farmer 25kg, £76.00, Clough farmer 23kg, £76.00, Rossglass farmer 23kg, £76.50, Ballybrannagh farmer 23kg, £75.00, Ballykilbeg farmer 25kg, £75.50, Ballybrannagh farmer 24kg, £74.50, Ballynahinch farmer 23kg, £74.50, Ballyculter farmer 24kg, £74.00, Strangford farmer 23kg, £74.00, Killinchy farmer 23kg, £74.00, Annacloy farmer 22kg, £73.50, Clonvaraghan farmer 22kg, £72.50, Downpatrick farmer 22kg, £71.50,Droamra farmer 21kg, £70.00,Ballyalton farmer 21kg, £68.00 and Crossgar farmer 21kg, £68.00. Tobercorran farmer £73, Downpatrick farmer £71.00, Ballykilbeg farmer £68.00 and Saintfield farmer £66. At the Friday night weanling calf sale on 14th October 2017 there was a very good entry of calves that sold to a top price per head of £870.00 other calves sold to a top price per kg of £2.79. 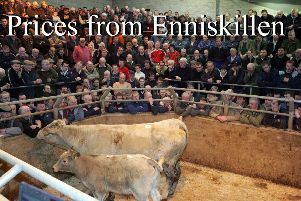 BULLOCKS: Downpatrick farmer 522kg Blonde D’Aquitaine, £1,030 (1.99ppk) Loughinisland farmer 324kg Charolais, £870 (2.69kg), Ballyculter farmer 376kg Charolais, £850 (2.26ppk) Castlewellan farmer 346kg Limousin, £835 (2.41ppk) and 326kg Limousin, £830 (2.54ppk), Ballyclander farmer 406kg Limousin £820 (2.02ppk), Loughinisland farmer 302kg Charolais £810 (2.68ppk), Castlewellan farmer 324kg Limousin £810 (2.50ppk), Loughinisland farmer 306kg Charolais £810 (2.64ppk) Castlewellan 338kg Limousin £800 (2.34ppk) Ballyclanderr farmer 386kg Limousin £790 (2.37ppk) and 388kg Hereford £790 (2.03ppk), Legamaddy farmer 340kg Bazadais £785 (2.31pk), Annacloy farmer 364kg Limousin £770 (2.12ppk), Loughinisland farmer 308kg Charolais £770 (2.50ppk), Ballyculter farmer 358kg Limousin £755 (2.11ppk), Castlewellan farmer 286kg Limousin £755 (2.64ppk), Legananny farmer 284kg Limousin £745 (2.62ppk), Saintfield farmer 294kg Limousin £735 (2.50ppk), Downpatrick farmer 360kg Blonde D’Aquitaine £735 (2.04ppk), Legananny farmer 270kg Limousin £725 (2.69ppk) and Seaforde farmer 290kg Charolais £725 (2.50ppk), Newcastle farmer 308kg Charolais £720 (2.34ppk), Ballyculter farmer 302kg Bazadais £710 (2.35ppk), Downpatrick farmer 310kg Bazadais £705 (2.27ppk), Crossgar farmer 320kg Limousin £700 (2.19ppk), Leitrim farmer 362kg Hereford £690 (2.45ppk) and 280kg Charolais £685 (2.45ppk) and Downpatrick farmer 306kg Limousin £685 (2.24ppk). Comber farmer 294kg Simmental £850 (2.89ppk), Downpatrick farmer 378kg Limousin £850 (2.25ppk), Comber farmer 320kg Limousin £800 (2.50ppk) and 282kg Simmental £770 (2.73ppk) and 300kg Charolais £750 (2.50ppk), 266kg Limousin £745 (2.80ppk), Downpatrick farmer 454kg Blonde D’Aquitaine £720 (1.59ppk), Newcastle farmer 342kg Limousin £710 (2.02ppk) and Leganannyfarmer 242kg Charolais £700 (2.88ppk) and Downpatrick farmer 302kg Belgian Blue £700 (2.32ppk) and Comber farmer 302kg Limousin £700 (2.32ppk) and Ballyclander farmer 320kg Limousin £695 (2.17ppk).